The Sodder Children: Fire Or Mafia Statement? Was it just a tragic accident, or was there a nefarious purpose? Was it a tragic loss of life, or a cover for a kidnapping? Was it just a matter of a grieving family’s grasp for hope, or were five children truly taken and were actually still alive? 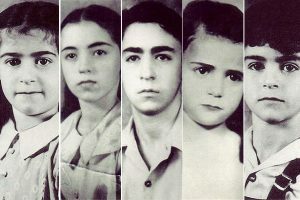 The sad story of five of 10 Sodder children in West Virginia in 1945 eventually caught the compassion and attention of the nation in the months and years following. The story is a clash between what has been “officially” determined about their fates, and the story pushed forward by the Sodder parents, who were never convinced that their children died in that house fire Christmas Eve night in 1945. The fire started from the fuse box at a two-story house where the Sodder family of George and Jennie Sodder and thei r 10 children lived. Five of the children, aged 5 to 14, where in the two attic bedrooms when the fire broke out, and the staircase that would have led downstairs was engulfed in flames, so the children had to find another way out. George Sodder, the father, tried to get up to the bedroom window from the outside of the house to rescue the children, but could not because a ladder that would have been used was missing (later found dumped in a nearby ravine). He tried as best he could, but could not reach the children, and was left to hopelessly watch the fire consume the entire house, and presumably the five children with it. The next morning, Christmas Day, there was a brief inspection of the fire scene (about two hours, when normal inspections will take days), and there were no human remains found on the property. The cause of the fire was officially recorded as due to faulty wiring, but George Sodder questioned that because he had an electrician re-wire the house recently, and the Christmas lights on the tree were still on and working while the fire burned around it. With no remains recovered, and the ladder missing and found later in an area that made no sense, the Sodders begin to think that the fire was used as a ruse to have the children kidnapped from their bedrooms, as some sort of retaliation by the Italian mafia in response to George’s public rants against Italian dictator Benito Mussolini. Sodder had become a pillar of West Virginia society as an owner of a small trucking company, so his anti-Mussolini rants were well-known among the Italian communities in the Eastern U.S., as there were a number of Italians who supported Mussolini – including most of the mafia that operated. George Sodder, in his haste to erase the memory of the fire, bulldozed the site soon after the initial investigation and buried everything under five feet of dirt, making all future investigations nearly impossible. Several investigations were undertaken in the years following, as there were eyewitness accounts of seeing the children leaving the house in a vehicle at the time of the fire, with even one waitress at a nearby diner serving breakfast to a “family” of children with a man on Christmas morning, with a car in the parking lot having a Florida license plate. Seventy years later, the youngest of the Sodder children, Sylvia, was the last surviving member from that home (she was about 2 at the time). She had continually pressed the issue about knowing the whereabouts of her siblings, and even passing the story down to her own children to pursue until final answers can be determined. There is a belief that death in the fire is most plausible conclusion, but there is also the belief that the kids were kidnapped and sent back to Italy. To this day, there is still no hard evidence on any website to support either result, so the mystery continues. Previous Previous post: The Lindbergh Baby Kidnapping: The Right Man?